A new plaque featuring an excerpt from Pres. 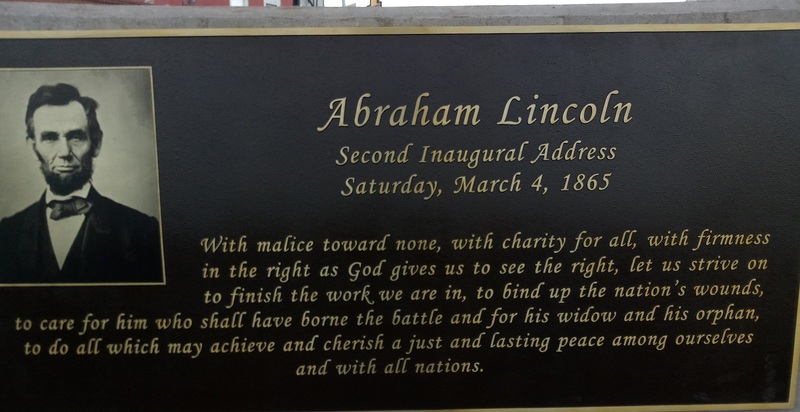 Abraham Lincoln second inaugural address has been installed in the Bradford County Veterans Memorial Park in Towanda. “We found it inspiring and a good fit for the general tone of our project,” said Joe Doherty, founder of the Bradford County Veterans Memorial Park Association. The plaque was paid for with trickle-down profits from the sales of memorial paver bricks. There are plans for two more plaques to balance out the installation, but board members have not yet determined the subject matter. While Doherty is considering an inspiring picture such as the Iwo Jima flag raising for one of them, he noted that the Association is seeking ideas for the second one. Suggestions can be emailed to Doherty at d1972470@npacc.net. For regular updates on progress at the park and ways to support the project, log on to www.bradfordcountyveteransmemorialpark.com for follow them on Facebook.